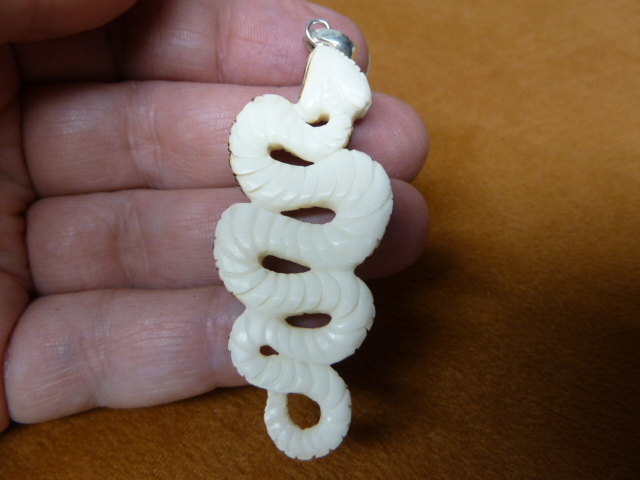 Pendants carved in Bali of cow bone; silver tone loop on pendant. 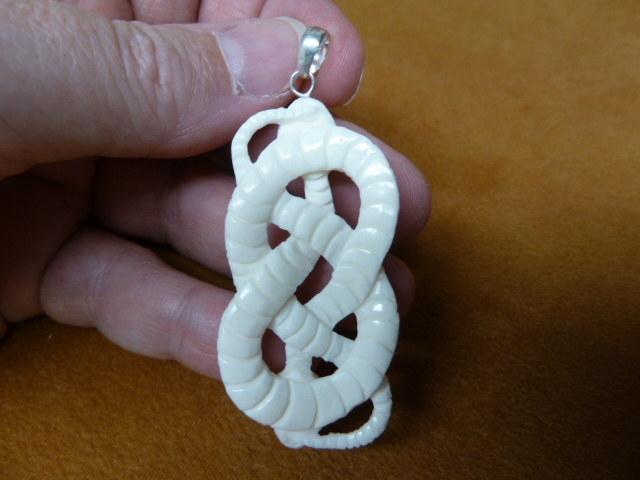 If you wish any pendant made into a necklace with beads, add $20 (specify length). 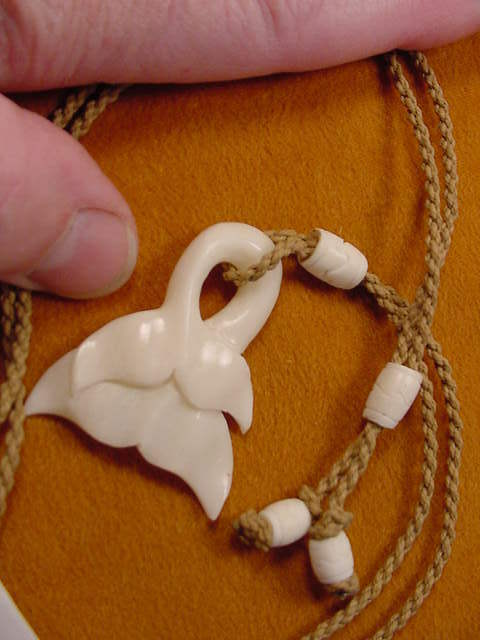 See other necklaces on this page for examples. 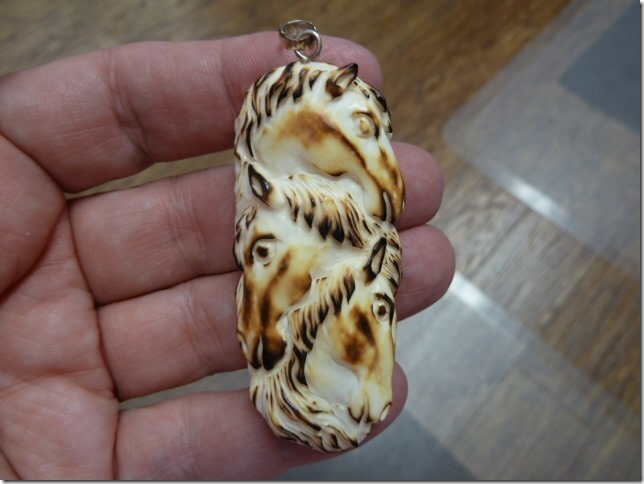 Bat carved in moose antler (side drilled through feet) pendant measures 2-1/8” long x 7/8” wide x 1/2” thick. Bear head is 3-D with awesome detail, 1-9/16" long x 3/4" wide. Carved of shed antler. Flat on back with nice detail. Each design is slightly different. The White Buffalo is lucky and sacred. Eagle head is 3-D with awesome detail. Measurements not including bail. 1-3/8" long plus loop x 1" wide. Adornments like octopus medallions were worn by sailors to ward off evil. Seamen understood the eerie magic of the octopus. It’s black ink-jet expulsions and other-worldly appearance struck awe (and terror) in the observer. Hence, it makes an incredibly powerful totem, carrying great status – a symbol of protection and good luck. 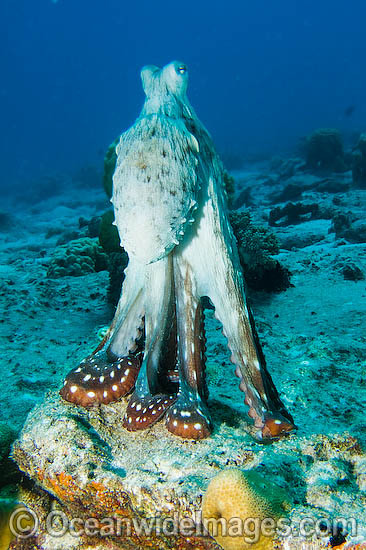 DON'T LET THIS OCTOPUS IN YOUR HOME! Ahhhh! A full 4" long showing fin detail; finished rounded & smooth on the back. Note similarity to the Goblin shark photo above. 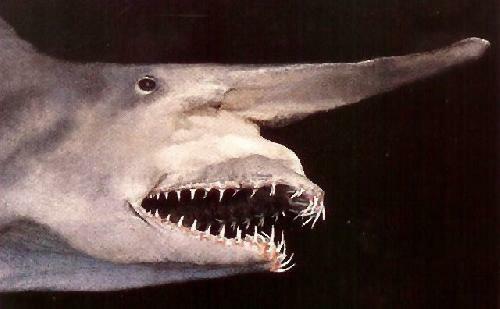 The Goblin shark has the unique ability to project its entire jaw far beyond its body to catch something., as the jaw is only attached to muscles. One of the sea's weirdest sharks. This is an example of the back side. 2" long x 1-1/2" wide, concave and smooth on back; beautifully wrapped over mama sea turtle's leg to a 28" braided natural cotton cording necklace; mama's eye is paua shell, small turtles eyes are black stone; white cow bone slider bead and white cow bone end beads allow it to be adjusted to any length. 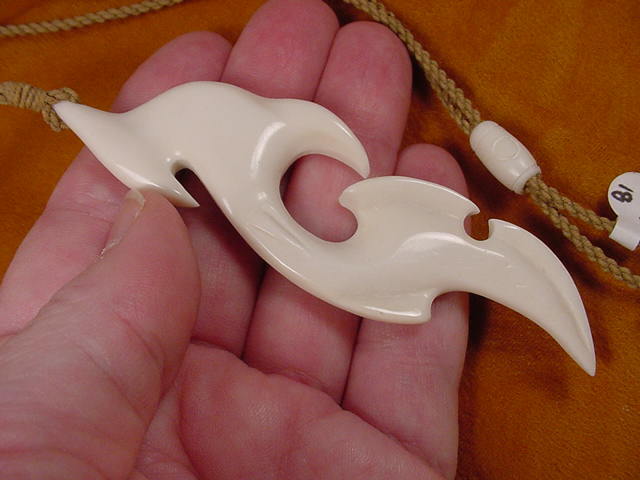 Maori hook with sea turtle is 2" long x 1-1/8" wide, flat on back, on 26" braided natural cord with sliding knot. 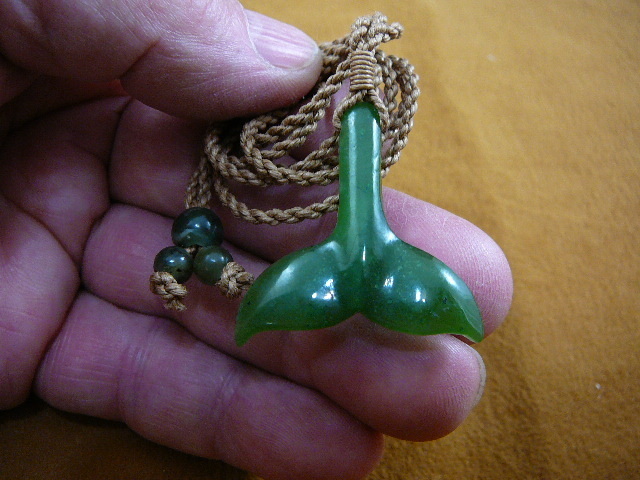 GREEN JADE WHALE TAIL, 1-5/8" long x 1-5/8" wide, knotted through hole drilled in top of tail, on 28" braided natural cotton cording necklace; jade slider bead and jade end beads allow it to be adjusted to any length. GREEN JADE, ROUND WHALE TAIL, 1-7/8" long x 1-1/4" wide, specialty wrapped on top, on 28" braided natural cotton cording necklace; jade slider bead and jade end beads allow it to be adjusted to any length.